The open clusters in the constellation of Hyades and Cancer are born. Open cluster is a group of stars that have been born at about the same time. They contain, at most, about a thousand stars. The name “open” comes from the feature that the stars are as if spread in the same region in the sky, like diamonds in a box (compare to the globular clusters). Gravity holds these stars together only weakly, and they usually disperse within about a million years. Sometimes they can stay together for longer, even for a billion years. The open clusters are an interesting study object, because all those stars have been born in the same conditions. This does still not imply that they all would be alike, as these clusters can contain also very different stars. 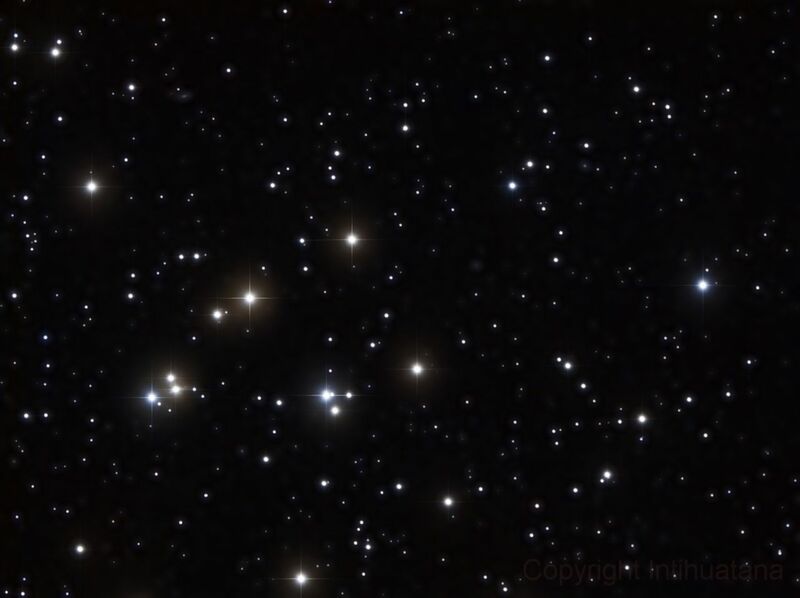 The Hyades cluster contains about 300 stars, and locates only at the distance of 115 light years. It is the closest open cluster to us. The brightest stars in the Hyades form the head of the constellation of Taurus. The brightest star of the Taurus, Aldebaran, does not belong in the Hyades, although it appears in the same region of the sky. Aldebaran is much closer to us, it is only 65 light years away. The Praesepe cluster locates in the middle of the Cancer constellation, about 577 light years from us. Praesepe is Latin, and means a manger. In English, the cluster is called also as a beehive cluster, because it looks like a honey comb. In 1609, Galileo Galilei focused his telescope on this cluster and counted 40 stars in it. Now we know that it contains about thousand stars.